If you move out of the marital home and leave your kids with their other parent, you’ve created a situation called “de facto” custody. There’s no court order in place, but for all practical purposes, your spouse has custody because she has your kids. By leaving, you’ve set a precedent with the court. You’ve effectively told an eventual judge that you’re comfortable with your kids living with the other parent while you live elsewhere. If you feel that you really must move out, try to maintain as much visitation time with your kids as possible. Courts often look for patterns when deciding custody and parenting time -- they want consistency for kids and are therefore reluctant to force changes on them. It’s likely that the routine you establish during this time will influence a judge’s custody decisions later. Either you or your spouse can file a motion with the court to set a temporary custody arrangement until a judge can decide the issue on a more permanent basis. In most states, you can do this even before you file for divorce. However, because courts prefer continuity for kids in divorce situations, it’s not uncommon for a judge to order temporary custody based on the de facto arrangement. Temporary orders govern until your divorce is final and a parenting plan is included in the terms of your decree. Technically, they are subject to change when the terms of your decree are decided. However, in actuality, courts often carry over the terms from temporary orders into divorce decrees as well. If you’re thinking about moving out, consult with an attorney first. 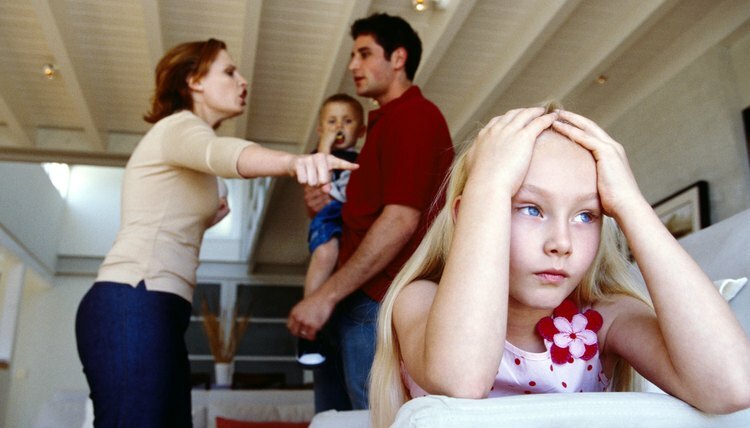 You may be unwittingly taking a step that could cost you custody of your kids when your divorce is final. Moving out and taking your kids with you, without a court order giving you temporary custody, usually isn’t an option. If your divorce is contentious, your spouse might file kidnapping charges against you. At worst, if you take your kids with you and refuse to allow your spouse to have contact with them, this is a federal crime. This is especially true if you hide your kids or remove them to another state. Even if your spouse doesn’t level such charges against you, a family court judge probably won’t see your actions in a favorable light. If you want to leave the marital home and take your kids with you, file for temporary custody first to get the court’s permission in an official order. Exceptions exist to the usual rules if you’re a victim of domestic violence. If your spouse is harming you or your kids, you have the right to leave and go to a shelter, and you can take your kids with you. Otherwise, you’re indicating to the court that you really don’t think your spouse is all that dangerous because you’ve left your kids in their other parent's care. However, even if you escape to a domestic violence shelter, you should take immediate steps to establish a temporary order giving you custody. You should also file a police report to establish that you or your kids were in danger when you left. Divorcenet.com: Should I Move Out? It's every parent's worst nightmare – as the channels of communication break down and your divorce becomes more heated and antagonistic, your spouse might take custody matters into his own hands. He might pick up your child for visitation under the terms of a temporary order and never come back. The only bright side to this horrifying scenario is that both Colorado law and federal law are on your side – with one exception that you can easily fix. What Do You Tell the Court if You & Your Spouse Don't Want a Divorce Anymore? When you take legal steps to end your marriage, you invite the court into your personal life. However, all states recognize no-fault divorce so you don't have to air your dirty laundry if you file your petition or complaint on no-fault grounds. The same applies to stopping your divorce proceedings if you change your mind about breaking up. You do not have to go into intimate detail when you ask the court to either postpone or dismiss your case.